So you’re writing a contemporary or historical mystery, or a romantic suspense thriller, or an urban fantasy, and your hero’s packing but you don’t know beans about guns. And your heroine’s a ballistics technician in the city’s Anti-Lycan Policing Organization (ALPO) and she’s going to make the positive comparison microscopic identification on the silver bullet that took down the head of the Wolverine gang, but you’ve got the same problem there. And you don’t want to depend on CSI Paranormal, because you just don’t trust them to get the details right, much less real. Tremble no more, hapless writer, because this primer’s for you. 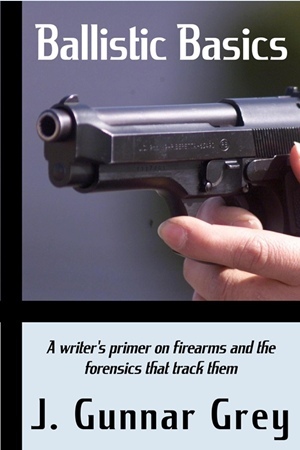 In this compact, easy-to-understand guide, an experienced mystery writer and target shooter takes you step by entertaining step through the mysteries of firearms and the ballistics that track them. You’ll learn the theory behind forensic ballistics, the timeline of firearms and forensics development dating back to the 10th century, the different categories of firearms, and what’s involved in a ballistics examination. It’s topped off with some examples of real-life historical crimes, showing how forensics technology advanced since 1912. But there’s more here than boring old facts. How does it feel to grab a large-caliber pistol and fire it in self-defense for the first time? What can a criminal do to camouflage a murder weapon? And how can a detective track a weapon so camouflaged? Which is best for a long-range firefight, a rifle, pistol, or shotgun? For a close-in, darkened room? What can a determined beginning shooter do to improve his wrist strength?